Good tonight not great but will only improve with Phelan coaching and a top elite level CB like Koulibally, he's still young must be kept like Lindeloft who really is coming of age right now. The brainfarts confused me because during pre season he was brilliant and looked very focused. Great game from him tonight. What a difference it makes having two CBs comfortable on the ball. Apparently all it took for Jones to have great performances was not making stupid errors. The last 7 matches . So it's only fair we judge Eric in the same way don't you think? Apparently all it took for Jones to have great performances was not making stupid errors. The last 7 matches. So it's only fair we judge Eric in the same way don't you think? He hasnt put in great performances? He had some good ones against easy teams. Some of which were better than Lindelof, but Lindelof has played in the majority of our big matches while Jones has only done well in the small ones. Best game for him in ages. Was always a bit too rash everyone writing him off. Hes young for a cb, showed very good potential in the past, has had awful luck with injuries and in a mess of a team with Mourinho. Everyone deserves a fresh start, hes far from the top of the list in terms of who should go even just looking at cbs. He looked calm and focused. Big big change! Loved that performance. If he actually manages to change his mental a bit and use that extra composure to get better at defending he might eventually become the best CB in the world some day. His attributes are there, except heading, he just needs to unlock his potential and first step is get rid of the irrational decision making. Bailly on the cover role, Lindelof took charge. Looking good these two, might be something special if they can build on from this. Also, he was as comfortable on the ball as he initially was when we signed him. Which makes his completely mediocrity on the ball in the timespan in between odd. When I watched clips of Bailly in La Liga and then his good phase at United, it was evident that while he isn't particularly gifted as a passer he is comfortable on the ball, yet as his confidence slipped away this aspect of his game also disappeared. Yeah, he wasn't very good passer but he had good composure on the ball and used to bring the ball out of defense using his little dribbles instead of just clearing it. Hopefully it was just confidence thing and he will be back to his best. He always has 10/10 and 0/10 moments in the same game. A bit like Nani. Good to see there was no 0/10 yesterday. I hope we put some effort and belief in him. He has the ingredients to be a good player if not a world class one. Some people here seem a little bitter. Sure he's made mistakes in the past, but he's young for a CB, possibly cares too much, and has so many positives to his game. Lindeloff took the lead as some have said, but Bailly did everything that was required of him. Considering how little football he's played recently, and how few minutes this partnership has had together, they both did great. Would love to add a world class CB to our squad, but I want to see Lindeloff, Bailly, and Tuanzebe developed. For those who are criticising him because an Arsenal side that just lost Bellerin decided to focus their attacks down our right... you need to catch yourselves on. Lindeloff did well in the game, but abandoned Shaw for the goal. Ramsey's chance was also at his near post. He is rightfully not receiving much criticism for that, but I feel this is a curtesy some of you wouldn't extend to Bailly ATM. The question is, is Jones being judged the same way as Bailly? I don't think he is that comfortable on the ball. Jones is a much better ball playing defender but for obvious reasons I would prefer we develop bally to be more comfortable on the bal. Not saying bailly isnt good on the ball but he can be better. There were times when he chose to pass the ball to the right hand side which was barren when he could easily scan the area to know that he could give the ball back to the left. Still he is just coming back and needs time under phelan. Very good showing, I really like him and hope he succeeds. Long way to go but a good effort last night. 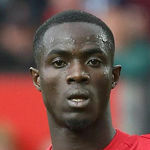 Good performance from Bailly yesterday. It's a correct analysis in my opinion. The coach team might have made him understand it during his suspension because against Arsenal it was felt that he had to have that thought in his head every time he came close to the ball. Or was it the suspension that he learned from? Really like him and hope it works out for him here. He's still young in CB terms and derserves the club to show faith in him. I think we will sign another CB so it will be him, Lindelof and Smalling fighting for a start. The rest here should be sold. Weirdly he sort of went under the radar for me the other day so I’m guessing that means he actually played quite well as normally it’s impossible to miss his all action throwing himself about. There was one great moment of class where he was forced in to the corner and he had the ability to find the gap for the pass. Not really much he could do about the goal. Ball went through his legs did it not and just out of Lindelofs reach then Shaw just can’t react quick enough after the Lacazette touch. You could argue that a centre back getting megged is something he ought to be able to do something about...still, otherwise he played well I thought. I have to admit that I had lost faith in him seeing his last performances. But seeing how much Lindelof has improved and the way Bailly played against Arsenal I have regained some faith. He can still become a world class defender, he has all the physicall attributes, strenght, speed, confortable on the ball. His problem seems to be mental, if he manage to control his emotions and the times of the game he sure will become what we expected him to be after his first season. Hopefully he can start today and keep the momentum going, we will need a solid pair of cbs against PSG and I think our best shot right now is the Lindelof and Bailly partnertship. That's genuinely the only mistake he made all game. Should have closed his legs and blocked it, but Ramsey was smart and cut the ball backwards instead of going down the line like he expected. Ideally though he should have blocked the cutback and let the goalkeeper deal with any balls going across the goal line area. Apart from that though he was excellent. As you say it was a very quiet performance which is what he needs really. No crazyness just good defending. To be honest I don’t think it would be practical to expect him to stop it going between his legs, he’s in a predicament where he is having to side shimmy, make himself big but be in a position where if the opposition change direction he can move and he’s not going to be able to do that by closing his legs or even doing the DeGea special of one knee down. Ramsey was it? Just picks the perfect ball and puts it in the one position Bailly can do nothing about so I wouldn’t hold that against him. Maybe he was too straight on but now we would just be getting nit picky hopefully we’ll see more performances like this where he just quietly goes about his job without the special effects. Why didnt he start against Burnley? He needs some game time. Did he have a Pyscho moment at training and injured Martial (and thus his injury)? Agree. Bailly has his moments but his a better defender than Jones any day of the week. Jones is hardly dominant in the air. Climbing all over the back of strikers back while missing the ball or letting them go on corners. Bailly is superior defender. He was not in the team and didn't start because he is either injured again or he is considered fourth choice, and rightly so. Nothing to see here. Smalling is fit again, means Bailly is back to being 4th choice. Where he belongs tbf. Jones has won 73% of his 42 aerial duels this season. Last season, it was 72% of 79, the other it was 68% of 67 and it was 83% of 24 in 2015/16. You are probably going off one or two occasions against Burnley and making them out as the norm. But it is Phil Jones we are talking about though, so I am not suprised. Spot on. He struggled in the air last night and he is clumsy as feck. Just a matter of time when he is going to cost us again. Bailly’s not great in the air. None of our defenders are bar Smalling. I’d say Bailly is weaker in the air than jones. Still better in the air than Bailly.